My Mr. Carrot would most likely not approve of this farm crush Friday recipient because I would guess that in his opinion this does not qualify as a real farm. I think he would probably categorize it more as a hoity-doity vacation spot that poses as a farm. He, of course, would be 100% correct. It’s not so much a farm as it is a massive agricultural and culinary enterprise. Luxury hotel and resort are the words they use. Ugh. I know. This is the absolute worst choice for farm crush Friday but one cannot control their crushes! And I still want to tell you about it! Because in my fanciful dreams, this is what I would love to one day have our little farmstead evolve into– on a much less grand, much less pretentious scale. Blackberry Farm is a 4200-acre estate located in the foothills of the Smokey Mountains, which may or may not have a strong influence over my mega-crush. Mr. Carrot and I got engaged atop a Smokey Mountain on a completely and totally blissfully perfect vacation two years ago so I am predisposed to fall in love with a farm in the Smokeys. I could also have fallen in love because this place is perfect. No, really. Blackberry Farm is serenely beautiful. It has that whole old world charm thing going on. There are acres upon acres of vegetables and livestock: all heritage or heirloom varieties and breeds. And a beautiful red historic barn that just happens to double as the (James Beard Award Winning) estate restaurant. They serve three meals a day in this magical place. And in between, they teach culinary classes with goodies fresh from the fields. They have a butcher, a beekeeper, a cheesemaker, and a preservationist all on staff. They know the food. They love the food. They celebrate the food. 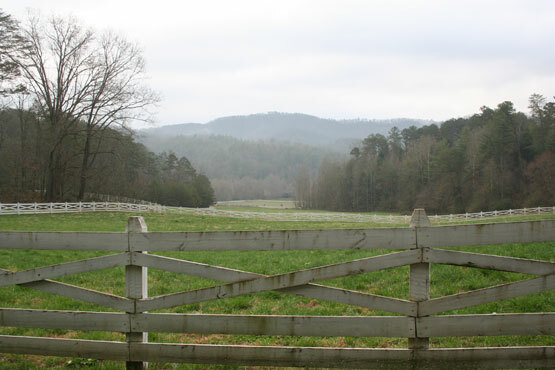 You stay at Blackberry Farm and there is no reason to eat anywhere else. No one knows more about the food of the region than the people in these kitchens. It’s so incredibly awesome. Then there’s the grounds themselves. From what the pictures tell me, they are vast and stunning. The farm has a misty pond and weeping willows and hiking trails. There are woods for foraging and of course there’s an orchard. There’s prairie. There are wildflowers. There are mountains in the background. They even provide picnic lunches and blankets upon request for exploring the estate, which is probably the most romantic idea for the most romantic setting in the entire universe. The “farm” also has a wellness spa and a team of sommeliers. Yes, a whole damn team of wine experts. I know. Now, it’s getting a little less serene and a little more annoying. I ignore these parts too. I’m all for wellness. Well, and good booze. But now we’re getting just a little too far a field from the whole farm thing. So we won’t talk about this stuff. We’ll pretend it’s not there because the little adorable farm hospitality vision in my little crushing mind does not include a team of wine sommeliers, or a wine cellar at all for that matter. Unless I ran the vineyard and personally made the wine and Mr. Carrot built the cellar. Then I’d be interested. And now, for the terrible part. It’s actually quite painful. I almost don’t want to ruin this for you. I’ve never been to Blackberry Farm. Nor will I likely ever find myself there. A room at this place is literally a grand per night. $1000+ for an evening. Or you can stay in one of their private cottages and then it’s more in the realm of $1800-$2000 a night. I know, I know, I know. It’s ridiculous. Completely ridiculous. And I don’t usually fall for things that are tailored to the 1% but this is different! This place, in all its crazy perfect ridiculousness, inspires me endlessly. I know I’ll never go there. I don’t even think I would want to go there if I had the funds because the vision it gives me for my & Mr. Carrot’s future is what I really love and I wouldn’t want visiting it in real life to ruin this vision: this beautiful, simple, rustic paradise in my mind that is just so incredibly us. Take out the fancy team of chefs in the fancy white pressed jackets with the froo froo tiny plates of food and instead add me, in a cute little apron. Maybe a different colorful apron for each night of the week. And add in hearty wholesome farmy meals made of whatever vegetables Mr.Carrot has too much of. Take out the $2000 cabins and add in cute cord-wood, timber-framed tiny homes that Mr. Carrot and I built ourselves, one at a time as funds allowed. Get rid of whatever those fancy schmancy rooms contain that makes them worth that much money and add in furniture made by our genius carpenter friend Billy or refinished by my handy husband. Add in artwork on the ways that’s made by our farm’s artist-in-residence. Lose the team of sommeliers and wine as expensive as two month’s rent and exchange it for pale ales that my Mr. Carrot brewed with hops we grew. Take out the professional animal husbandry experts that Blackberry Farm no doubt hires and add in a friend or two who wants to try their hand at raising meat animals. Get rid of the wellness center and add in sunrise and sunset yoga only offered barefoot in the fields taught by my beautiful friend Andrea. Get rid of any ounce of pretension by adding porch swings and tire swings and bonfire pits everywhere. Keep the prairie. Keep the wildflowers. Keep the woods and rolling hills. Keep the spontaneous picnics. Keep the barn dining hall. Lose the stiff 18th century furniture in the dining hall and add in picnic tables and mismatched dishes from Goodwill. Keep the love and celebration of food grown so locally you can walk from the dining hall to the field where its grown in 5 minutes. Add in as many friends and their accompanying passions as we can. This is us. This is our Blackberry Farm. This is my ultimate farm crush. Happy Friday!!!! -Leek P.S. 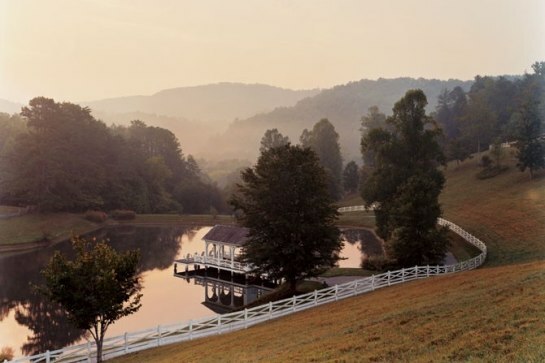 I have never been to Blackberry Farm so these photographs are not mine. The credit for each photo is given in the title.